pose Aug. 4 outside the White House. To say that the experience has been one of the most amazing in my life is a true understatement. I’ve had the chance to help plan our three regional training events (where college students learn more about social justice and creating their own blueprints for social change) in Cleveland, San Diego and Charlotte. I have also had the privilege to gain hands-on experience in the process of evaluating the organization’s programs, and I am currently working on a one-pager report that summarizes the data along with recommendations to enhance our regional trainings. During my time in Washington, I have walked past the White House on several occasions, hoping that I someday I would have chance to go inside for a visit. 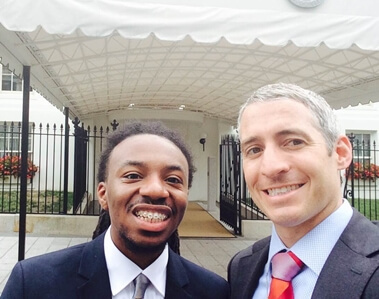 Last week, thanks to Coupon Cabin founder and NIU alumnus Scott Kluth, my dream of visiting the White House became a reality. On Aug. 4, I was fortunate to meet Scott’s good friend Greg Shultz, senior adviser to the vice president and special assistant to the president at the White House Mess. Over a lunch of beef tacos, Mr. Schultz and I spent a lot time learning about each other’s upbringings. Mr. Schultz attended Ohio State University, receiving his bachelor’s in history and political science and, later, a Master of Education. I learned that Greg’s mother and father were both special education teachers, and that fact was very dear to me, as my younger brother Travell is autistic. Greg has worked for several of the country’s top political leaders, including former Ohio Gov. Ted Strickland, former Secretary of State Hilary Clinton and President Barack Obama. during his Aug. 4 visit to the White House. During our lunch at the White House, I shared my story with Mr. Schultz. I spoke about growing up on the west side of Chicago, playing basketball, learning piano at Curie High School and eventually coming to Northern Illinois University, where I started The Remember Project – a nonprofit organization that unites college students in coming back to Chicago to be positive role models for inner-city youth through volunteering. 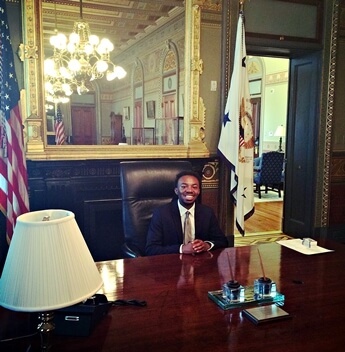 After lunch, I had the opportunity to shadow Greg for an hour as he went through his normal, everyday activities in his office at the White House. We ended the day by going to the vice president’s Ceremonial Office. It was very humbling to sit and see some of the most historic vice presidential signatures engraved inside the office desk. To remember this experience, I now have a White House Mess menu, Greg’s business card and two boxes of President Obama Signature M&Ms. More importantly, Greg and I promised to keep in touch! I cannot thank Scott Kluth and Greg Schultz enough for making my dream visit to the White House come true. As a result, I have a new friend and mentor in Greg, and I hope that one day I can inspire others like both Greg and Scott have inspired me. Thank you both for providing me with an experience that I will cherish for the rest of my life.